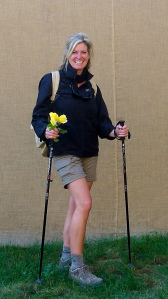 It was an honor and a pleasure to be asked to speak at the Fairway Forum Del Camino De Santiago October 15 – 18, 2015. It was wonderful to share in a special experience with fellow pilgrims and camino enthusiasts. Inspiring stories and exciting camino projects shared by all who presented, participated and attended. The Camino Spirit continues to spread its magic wings and touch all in its path! A very special thank you to Fairway Forum for inviting me and to my parents Raymond and Beverly Beuligmann who traveled from the USA – through Germany, France and across Spain making a Camino by plane, car, bus and train to share in this special Camino Conference with me. I am forever grateful to my family, friends and fellow pilgrims who have made my Camino Pilgrimage possible a JOURNEY that continues!!!! Unscripted Journey – Our Collective Camino is the first book of this type of collaboration uniting voices of more than 45 authors from 13 countries around the world who share a passion, love and the pilgrim spirit that is the real heart of the Camino. Inspired by the desire to Susan to work to publicize the experience unique and inimitable, each pilgrim. Susan also explained in Santiago the launch of “El Camino del vino” (Wine Tasting Along The Way), a program to promote travel inspired by the personal experiences of Susan on the road with the aim to promote and share the Way, Galicia, Spain and connections worldwide through the discovery and enjoyment of food and wine. History and exploring different cultures is one of the true pleasures of a travel adventure. Immersing ourselves into wonderful experiences that are colorful, vibrant and make us feel alive. It is always a delight to explore and discover new traditions of cultural expression and it was my pleasure to arrive in Ribadavia in the Ribeiro Wine Region just in time for the Xornadas De Folklore 32nd annual celebration of dance. Held in the cities ancient Castle it was the perfect night and setting to share in watching dancers from Xeorxia Georgia – Gori, Taiwan, México, Philippines, Russia and Brazil. It was definitely a night to remember making for more special memories in Galicia and the Camino!